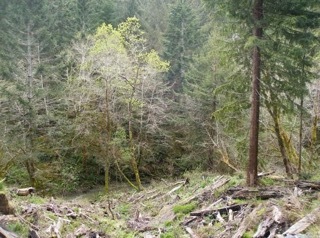 Green Diamond Resource Company to clearcut log east of Eureka, CA. This THP is about 20 miles east of Eureka, CA, about 6 miles east of the community of Maple Creek near Snow Camp Lake. Green Diamond Resource Company is planning a mostly clearcut feller buncher and shovel logging operation in Douglas fir, white fir and incense cedar forests. The THP area flows into the Mad River and Redwood Creek which are listed as impaired watersheds for sediment and temperature. 11 road drainage sites are planned for use including rocking, dip construction, ditch cleaning and culvert repair/replacement. In 1990, pacific fisher sightings were reported inside units A, B and C, in 2000, a sharp shinned hawk was spotted 1.7 miles SW of the THP area, and in 1996, a Cooper's hawk was spotted 2.1 miles south of the THP area. There are trees up to 40" dbh in units A, B, D, E, trees up to 50" dbh in unit C, and 12+ spotted owl nesting territories within 1.3 miles of the THP area. Mendocino Redwood Company planning a pair of THPs between Fort Bragg and Willits, CA. 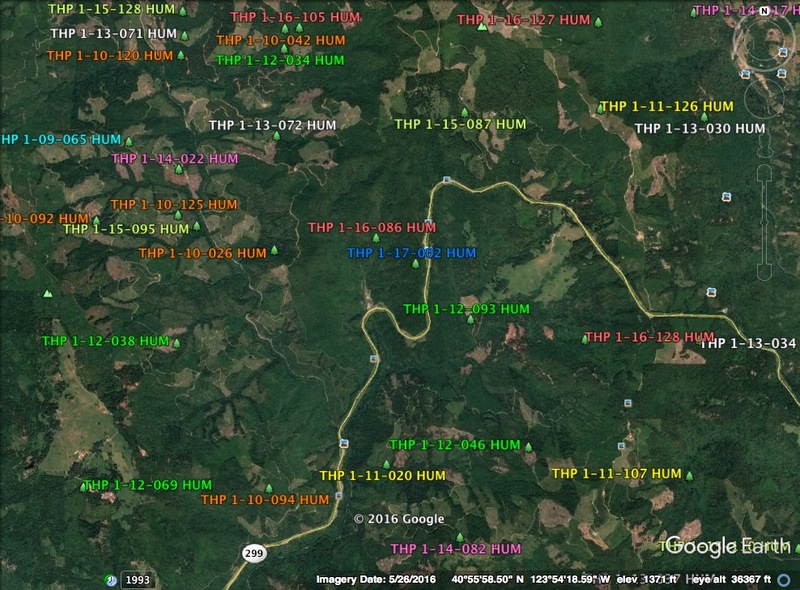 This THP is 14 miles SE of Fort Bragg, CA, 11 miles SW of Willits, CA and about 3 miles south of Highway 20 at an elevation of 280 to 1,400 feet. Mendocino Redwood Company is planning a tractor and cable logging operation on steep and unstable slopes in redwood and Douglas fir forests. The THP area flows into the Big River which is listed as an impaired watershed for sediment and temperature. There are 3 landslide terrain sites including 2 earth flows and 1 debris slide, and 11 road related failure sites including; multiple cut bank and fill slope failures, multiple sites of vertical displacement of the road bed, debris slides, rock slides and earth flows. 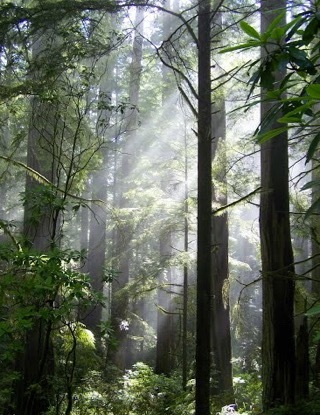 Mendocino Redwood Company is planning to use ground based equipment in areas designated for cable logging. 30 road drainage sites are planned for work including rocking, dip construction, ditch cleaning, culvert repair/replacement and restoration of washed out crossings. Oregon good thread was found in section 27, Maple leaved checkerbloom was found in section 27 and Long beard lichen was found in section 36. There are 9 spotted owl nesting territories within .7 miles of the THP area. This THP is just SW of Mendocino Redwood Company’s recently proposed Upper Ranch THP 1-17-014 MEN. 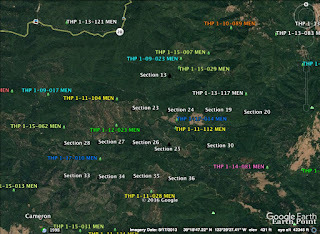 This THP is 15 miles SE of Fort Bragg, CA, 7.68 miles SW of Willits, CA and about 2 miles south of Highway 20 at an elevation of 320 to 960 feet. Mendocino Redwood Company is planning a tractor and cable logging operation on steep and unstable slopes in redwood and Douglas fir forests. The THP area flows into the Big River which is listed as an impaired watershed for sediment and temperature. There are 10 landslide terrain sites in the THP area including debris slides, steep inner gorges, earth flows and 14 road related failure sites including fill slope, cut bank, and road bank instability. Mendocino Redwood Company is planning to use ground based equipment on steep slopes over 65% grade in areas designated for cable logging and re-construct 200 feet of existing seasonal road inside a class II (mid sized) watercourse. There are steep slopes over 50% grade with a high erosion hazard, and 4 landings that extend into class I (year round) watercourse areas. 64 road drainage sites are planned for work including rocking, dip construction, ditch cleaning, culvert repair/replacement and restoration of washed out crossings and sink holes. A marbled murrelet stand is located just south of the THP area, and there are 5 spotted owl nesting territories within 1.3 miles of the THP area. This THP is just NE of Mendocino Redwood Company’s recently proposed Kelly Gulch THP 1-17-010 MEN. 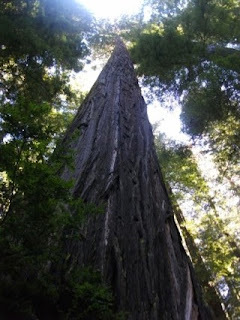 Humboldt Redwood Company to helicopter log trees up to 70” dbh near Grizzly Creek State Park. This THP is about 6 miles SE of Carlotta, CA and just north of Highway 36 near Grizzly Creek State Park (units 1 & 10 are adjacent) at an elevation of 400 to 1,400 feet. Humboldt Redwood Company is planning a tractor, cable and helicopter logging operation on steep and unstable slopes in redwood, Douglas fir and grand fir forests. Helicopter logging is planned adjacent to large tree marbled murrelet stands D619 and D575, and units 1, 2, and 6 have trees up to 48" dbh, and units 3, 4, 5, 7, 8 and 9 have trees up to 70" dbh. The THP area flows into the Van Duzen River which is listed as an impaired watershed for sediment/siltation and temperature. There are 40 landslide terrain sites in the THP area including; multiple debris slides, debris slide slopes, earth flows, rock falls, and disrupted ground. Humboldt Redwood Company is planning to use ground based equipment in areas designated for cable or helicopter logging, construct 2 segments of road L53.2251 across an unstable area in unit 2, and use an existing skid road inside a class III (mid sized) watercourse area. 28 road drainage sites are planned for work including rocking, dip construction, ditch cleaning, culvert repair/replacement and restoration of washed out crossings. There is a Pacific fisher den site within .25 miles of the THP area, and 15 spotted owl nesting territories within 1.3 miles of the THP area. 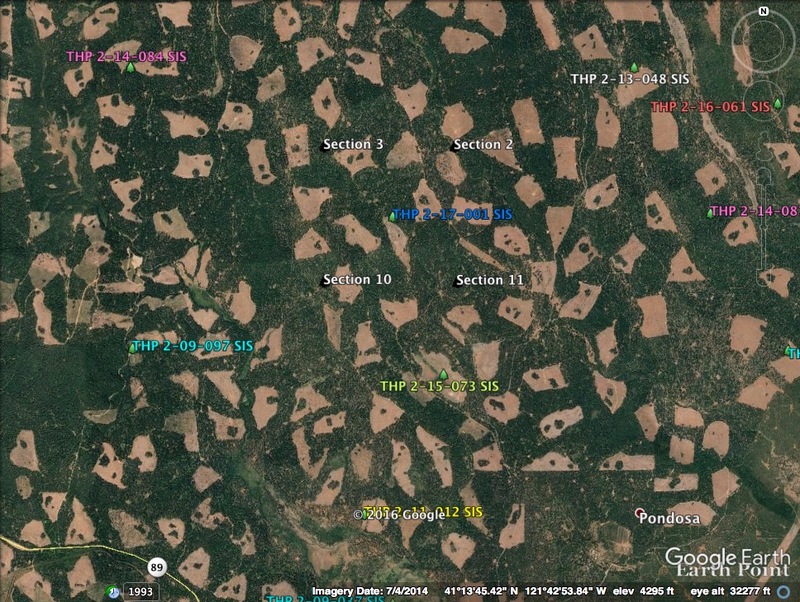 Roseburg Resources Company to clearcut log east of McCloud, CA. This THP is about 21 miles east of McCloud, CA and about 3 miles NW of Pondosa, CA and Highway 89 at an elevation of 4,100 to 4,640 feet. Roseburg Resources Company is planning a 100% clearcut tractor based logging operation in ponderosa pine, sugar pine, Douglas fir, white fir, incense cedar and lodge pole pine forests. Construction of roads and landings are proposed during the winter period. Historic northern goshawk sightings were reported in sections 09, 23 and 34, and a bald eagle was observed 1 mile south of the THP area. There is an active willow flycatcher population at Bear Creek bridge on Pondosa Way, and long haired star tulip was found in unit 1101. 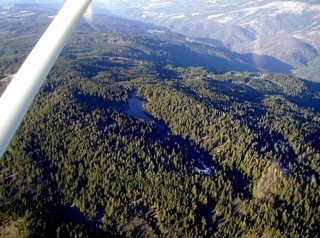 Green Diamond Resource Company to log on steep and unstable slopes NE of Klamath, CA. This THP is about 4 miles NE of Klamath, CA and Highway 101 at an elevation of 560 to 2,200 feet. Green Diamond Resource Company is planning tractor and cable logging operation on steep and unstable slopes in redwood, western hemlock, western red cedar and Douglas fir forests. The THP area flows into the Klamath River which is listed as an impaired watershed for sediment, temperature, dissolved oxygen and nutrients. There are 8 unstable areas including; 3 deep seated landslide terrain sites on the eastern edge of unit C, 1 shallow rapid landslide terrain site in unit C, 2 shallow rapid landslide terrain sites in unit D, and 2 landslide terrain sites on steep stream side slopes in the northern edge of unit C. Green Diamond Resource Company is planning to construct 2 segments of temporary road on slopes over 50% grade that does not flatten before reaching a watercourse, construct a temporary steep road in unit C with a grade exceeding 20% for 300 feet, and construct a temporary steep road in unit D with a grade exceeding 20% for 200 feet. Six road drainage sites are planned for work including rocking, dip construction, ditch cleaning, culvert repair/ replacement and restoration of washed out crossings. Several bald eagle nests are located along the Klamath River 1.5 miles SW of the THP area, and a pacific fisher was reported inside unit C in 1994. There is marbled murrelet habitat on Green Diamond Resource Company lands and 2 osprey nests are located within .25 miles of the Arrow Mills Road. A sharp shinned hawk was observed in 1997, 250 feet south of unit A, southern torrent salamanders are known to occur in unit C, and there is an historic great blue heron rockery 1.6 miles SW of the THP Area. Seven northern spotted owl nesting territories are located within 1.3 miles of the THP area, including spotted owl nesting territories within .25 miles of units A and C, and within .5 miles of unit D.
Green Diamond Resource Company to Rehab log north of the Highway 299 Coast Range Summit. This THP is about 10 miles NE of Arcata, CA and about 3 miles north of the Highway 299 coast range summit at an elevation of 1,120 to 3,400 feet. Green Diamond Resource Company is planning a mostly rehab (similar to clearcut logging - used to re-set a stand) tractor and cable logging operation in Douglas fir forests. The THP area flows into Redwood Creek which is listed as an impaired watershed for sediment and temperature. Unit D has trees over 60" dbh, and there is a small shallow rapid landslide terrain site in unit B. Green Diamond Resource Company is planning to construct and use roads and landings during the winter period. Eight road drainage sites are planned for work including rocking, dip construction, ditch cleaning, culvert repair/ replacement and restoration of washed out crossings. There are 7 spotted owl nesting territories within 1.3 miles of the THP area, including spotted owl nesting territories within .25 miles of unit B, and .5 miles of unit A. 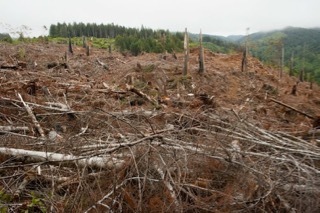 Green Diamond Resource Company to clearcut log near the Highway 299 Coast Range Summit. 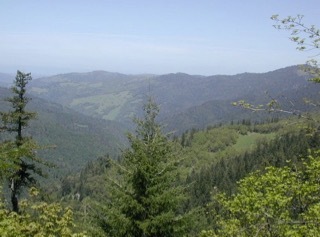 This THP is about 8 miles NE of Arcata, CA near the Highway 299 coast range summit at an elevation of 550 to 1,740 feet. Green Diamond Resource Company is planning a tractor and cable logging operation on steep and unstable slopes in redwood and Douglas fir forests. The THP area flows into the Mad River which was listed as an impaired watershed for sediment, turbidity and temperature. There are multiple road failure sites including fill slope failures, cut bank failures, bank sloughing, gullying and erosional voids near crossings. 19 unstable areas are located in the THP area including; 3 shallow rapid landslide terrain sites along the northern boundary of unit A, 1 shallow rapid landslide terrain site along the NW boundary of unit A, 2 small roadside fill failures off the K&K 92 Road, 4 shallow rapid landslide terrain sites along the western boundary of unit A, 1 shallow rapid landslide terrain site along the central portion of unit B, 1 shallow rapid and 1 deep seated landslide terrain sites along the SE boundary of unit B, 1 shallow rapid landslide terrain site in the western portion of unit D, 1 deep seated landslide terrain site in the northern central portion of unit B, 1 shallow rapid landslide terrain site in the eastern portion of unit D, 1 deep seated landslide terrain site in the central portion of unit E, 1 deep seated landslide terrain site in the eastern portion of unit E, and a 1 deep seated landslide terrain site in the NW portion of unit E. Green Diamond Resource Company is planning to use ground based equipment in areas designated for cable logging in unit A, and use a short segment of seasonal road inside unit B within a class I (year round) watercourse area. They also want to use ground based equipment in unstable areas on 3.3 acres of deep seated landslide terrain within unit D, and on unstable areas on the K&K 90 and K&K 92 Roads. 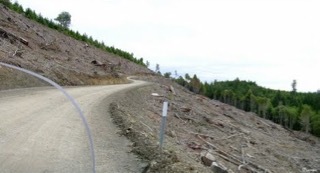 Over 600 feet of temporary road is proposed for construction on steep slopes over 65% grade, and 3 segments of road are proposed for construction with average grades exceeding 15%, including grades over 20% for 500 feet. 33 road drainage sites are planned for work including rocking, dip construction, ditch cleaning, culvert repair/ replacement and restoration of washed out crossings and sink holes. 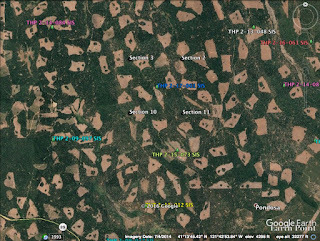 There are 12 spotted owl nesting territories within 1.3 miles of the THP area including, spotted owl nesting territories within .25 miles of units B, E and F, and within .5 miles of units A, C and D.
Green Diamond Resource Company to clearcut log south of Klamath, CA. This THP is about 2.5 miles south of Klamath, CA near Highway 101 and the eastern boundary of Redwood National Park at an elevation of 320 to 800 feet. Green Diamond Resource Company is planning a mostly clearcut tractor and cable logging operation on steep and unstable slopes in redwood, western hemlock, Sitka spruce and Douglas fir forests. The THP area flows into the Klamath River which is listed as an impaired watershed for sediment, temperature, dissolved oxygen and nutrients. A Special Treatment Area (STA) will be located inside unit D within 200 feet of Redwood National Park to hide the effects of clearcutting. There are 17 unstable areas in the THP area including; 1 shallow rapid landslide terrain site in the SW portion of unit B, 1 shallow rapid landslide terrain site in the eastern portion of unit C, 8 shallow rapid landslide terrain sites in the NW portion of unit D, 1 deep seated landslide terrain site in the northern portion of unit E, 2 shallow rapid landslide terrain sites near haul roads in unit F, 1 shallow rapid landslide terrain site on the fill slope of a haul road near Highway 101, and 3 shallow rapid landslides on a road cut adjacent to Highway 101. Multiple road failure sites exist in the THP area including fill slope failures, cut bank failures, bank sloughing, gullying and erosional voids near crossings. Green Diamond Resource Company is planning to use a segment of existing temporary road between two class II (mid sized) watercourses for loading and decking operations inside unit D, and construct a steep seasonal road over 20% grade, and construct a temporary road in unit D which may exceed 15% grade for over 200 feet. They also want to construct a seasonal road within 150 feet of a class I (year round) watercourse, and construct another temporary road inside a class II (mid sized) watercourse in unit D. 13 road drainage sites are planned for work including rocking, dip construction, ditch cleaning, culvert repair/ replacement and restoration of washed out crossings and sink holes. 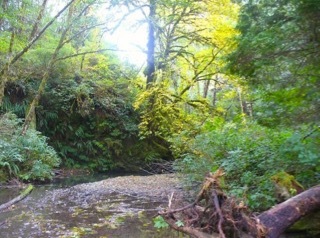 Two historic osprey nests are adjacent to Highway 101, and within .25 miles of two permanent haul roads, and tailed frogs are known to occur in or immediately adjacent to unit H. Marbled murrelet habitat is located on Prairie Creek Redwoods State Park lands within .25 miles of several seasonal and permanent haul roads, and on Green Diamond Resource Company lands within .25 miles of the MG-170 Road. A spotted owl nesting territory is located within .5 miles of units C and F.
This THP is about 6 miles north of Klamath, CA and about 9 miles SE of Crescent City, CA at an elevation of 1,000 to 1,600 feet. 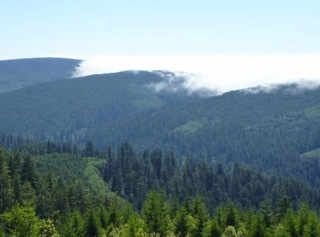 Green Diamond Resource Company is planning a clearcut tractor and cable logging operation on steep and unstable slopes in redwood, Douglas fir and western hemlock forests. There are 3 unstable areas in the THP including a shallow rapid landslide terrain site in unit B, and 2 shallow rapid landslide terrain sites in unit C. Green Diamond Resource Company is planning to use temporary roads and landings during the winter period. An historic osprey nest is located within .25 miles of the W10 Road, and marbled murrelet habitat is located within .25 miles of the W10 Road and H200 Road. There is a wet area in unit A. 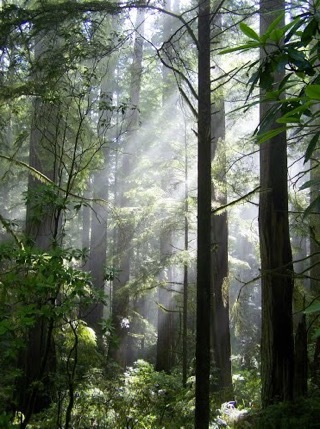 Five spotted owl nesting territories are located within 1.3 miles of the THP area, including spotted owl nesting territories within .5 miles of units A and C.
Green Diamond Resource Company to clearcut log NE of Trinidad, CA. This THP is about 5 miles north of Trinidad, CA and a few miles NE of Patrick's Point State Park near Big Lagoon and Highway 101 at an elevation of 600 to 2,000 feet. Green Diamond Resource Company is planning a mostly clearcut tractor and cable logging operation in redwood, Douglas fir, Sitka spruce, western hemlock and pine forests. There is marbled murrelet habitat within .25 miles of the LP Mill Road, within 1.02 miles of unit D, within .25 miles of the BL 2000 Road, and adjacent to Highway 101 on state park property. An osprey nest is located within .25 miles of the LP Mill Road, and within .29 miles of Highway 101. A second osprey nest is located within .25 miles of the BL 1000 Road, and a third osprey nest is located within .25 miles of the BL 2000 Road. A bald eagle nest is located 1.2 miles NW of the THP area, a sharp shinned hawk was reported in 2007 approximately 1.3 miles east of unit E, and a great blue heron rockery exists .22 miles east of the BL 2000 Road. There are 2 spotted owl nesting territories within 1.3 miles of the THP area. Green Diamond Resource Company to log on steep and unstable slopes south of Klamath, CA. This THP is about 3 miles south of Klamath, CA near the eastern boundary of Redwood National Park and Highway 101 at an elevation of 80 to 960 feet. Green Diamond Resource Company is planning a tractor and cable logging operation on steep and unstable slopes in Douglas fir, redwood, western hemlock, Sitka spruce and western red cedar forests. The THP Area Flows into the Klamath River which is listed as an impaired watershed for sediment, temperature, dissolved oxygen and nutrients. There are 5 unstable areas within the THP; including a shallow rapid landslide terrain site in unit C, and 4 shallow rapid landslide terrain sites in unit F. Six road drainage sites are planned for work including rocking, dip construction, ditch cleaning, and culvert repair/replacement and restoration. A bald eagle territory is located 1.5 miles NE of unit A, marbled murrelet habitat is located on Redwood National Park lands within .19 miles of unit E, within .25 miles of the SA-10 Road, and adjacent to Highway 101 near THP units. There is a historic great blue heron rockery 1.3 miles NE of the THP area, and southern torrent salamanders and tailed frogs are known to occur in and immediately adjacent to unit F. Two spotted owl nesting territories are located within 1.3 miles of the THP area and within .5 miles of unit F.
Green Diamond Resource Company to log on steep and unstable slopes south of Eureka, CA. This THP is about 4 miles south of Eureka, CA and Highway 101 near the community of Ridgewood at an elevation of 100 to 500 feet. Green Diamond Resource Company is planning a tractor and cable logging operation on steep and unstable slopes in redwood, Sitka spruce and Douglas fir forests. The THP Area Flows into Freshwater Creek which is listed as an impaired watershed for sediment. There are shallow rapid landslides adjacent to units A, C, D and E, and 3 deep seated landslide terrain sites in units A and C. 18 road drainage sites are planned for work including rocking, dip construction, ditch cleaning, culvert repair/replacement and restoration of washed out crossings. An historic osprey nest is located 60 feet outside of unit A, 430 feet outside of unit B and within .25 miles of THP roads. A second osprey nest is located within .25 miles of units B and C, and 3 additional osprey nests are located within .25 miles of the R Line Road. An historic peregrine falcon nest site is also located within .25 miles of the R Line Road. There are over a dozen spotted owl nesting territories within 1.3 miles of the THP area, including spotted owl nesting territories within .25 miles of units B, C and E, and within .5 miles of units A and D.
Green Diamond Resource Company to log on steep and unstable slopes east of Orick, CA. 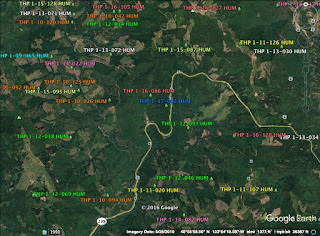 This THP is about 14 miles NE of Trinidad, CA and 17 miles SE of Klamath, CA near Orick, CA and Redwood National Park at an elevation of 980 to 2,260 feet. Green Diamond Resource Company is planning a tractor and cable logging operation on steep and unstable slopes in redwood and Douglas fir forests. The THP area flows into the Klamath River which is listed as an impaired watershed for sediment, temperature, dissolved oxygen and nutrients. There are 25 unstable areas within the THP including; 5 shallow rapid landslide terrain sites and 2 deep seated landslide terrain sites in unit A, 5 shallow rapid landslide terrain sites and 1 deep seated landslide terrain site in unit B, 2 shallow rapid landslide terrain sites and a cut slope failure in unit C, 5 shallow rapid landslide terrain sites and 1 deep seated landslide terrain site in unit F, and 4 shallow rapid landslide terrain sites in unit H. Multiple road failure sites exist including bank sloughing, erosional voids, gullying, fill failures and cut bank failures. Green Diamond Resource Company is planning to construct and use temporary roads and landings during the winter period, and construct and/or re-construct steep segments of roads on slopes over 65% grade. 23 road drainage sites are planned for work including rocking, dip construction, ditch cleaning, culvert repair/replacement and restoration of washed out crossings. There is marbled murrelet habitat on Redwood National Park lands within .25 miles of the mainline TT-100 Road, and Del Norte salamander habitat in unit B. Three spotted owl nesting territories are located within 1.3 miles of the THP area, including spotted owl nesting territories within .5 miles of units E and H.
Green Diamond Resource Company to clearcut trees up to 7 feet in diameter east of Eureka, CA. This THP is about 17 miles east of Eureka, CA and Highway 101 at an elevation of 1,860 to 3,560 feet. Green Diamond Resource Company is planning a mostly clearcut tractor and cable logging operation on steep and unstable slopes in Douglas fir forests. Trees up to 84" dbh were reported in unit H, trees up to 72" were reported in units J and M, trees up to 60" dbh were reported in units A, B, C, E and L, and trees up to 52" dbh were reported in unit I. The THP area flows into the Mad River which is listed as an impaired watershed for sediment, turbidity and temperature. There are 32 unstable landforms in the THP area including 15 shallow rapid landslide terrain sites, 17 deep seated landslide terrain sites, and multiple road failure sites with bank sloughing, fill failures and cut bank failures. Green Diamond Resource Company is planning to use an existing road inside a class II (mid sized) watercourse area in unit I for loading, decking and yarding purposes, and use the SC 2200 Road inside a class II (mid sized) watercourse area adjacent to unit A for loading, decking and yarding purposes. They also are planning to use roads and landings during the winter period, and use ground based equipment to construct and/or re-construct a road across an unstable area in unit K for yarding and decking operations. 35 road drainage sites are planned for work including rocking, dip construction, ditch cleaning, culvert repair/replacement and restoration of washed out crossings. In 1996, a Cooper's hawk was reported 2.3 miles SE of the THP area, in 2000, a sharp shinned hawk was reported 1.4 miles SE of the THP area, and a golden eagle was recently spotted 1 mile SW of the THP area. Red tree voles were detected in units F and L in 2003, and in units D and E in 2004. There are 8 spotted owl nesting territories within 1.3 miles of the THP area, including spotted owl nesting territories within .25 miles of units A, B, C, D, E, F H, I and M, and within .5 miles of units G, J, K and L.